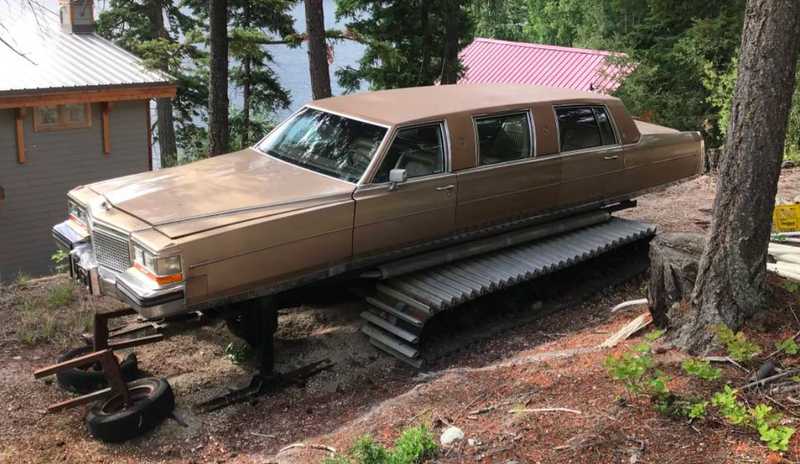 Robert Falck from Vancouver is selling a 1989 Cadillac Brougham limo that has skis instead of front wheels, and tracks instead of rear wheels. It’s a wacky build that was made specifically for the big screen, and it can be yours for only $6,000. On Craigslist in Vancouver, British Columbia is an old Cadillac built on a Bombardier SV250 Skidozer platform, and outfitted with a bunch of full-size GM truck parts. It looks incredible. Falck told me he built the project for a movie after being given the Cadillac, and supplying his own Snowcat parts. Using square tubing, Falck built a ladder frame to attach the Caddy to the Bombardier. He used another Snowcat, a Bombardier B12 (a model that he used to own), as design inspiration for this incredible machine, which also has skis up front and tracks out back. The front skis are attached to a modified, raised suspension. The steering setup is also different, with Falck installing a power steering cooler, and replacing the Cadillac’s design with a large rack and pinion setup aimed at resisting bump steer, a phenomenon where the wheels turn on their own during suspension articulation. As for the back, a TH350 three-speed automatic transmission sends the small-block Chevy V8's power through a low-range transfer case out of GM truck, and then to a one-ton axle. A driveshaft brake, Falck told me, is the primary mechanism for stopping the Cadillac snowmobile, though drum brakes in the rear axle just behind the sprockets are also there to bring the huge beast to a halt. On the sides of this tank are huge side-pipes, and inside is just a standard Cadillac interior. Falck said he built this contraption for a movie, which featured a rich guy who owned a ski resort. When filming was done, the Vancouverite decided to buy the Caddy back. Now it’s up for sale on Craigslist for a price that, he says, doesn’t reflect what he’s put into the vehicle. Falck says the thing will move, but it’s not likely to climb a mountain or blaze its own trail; the vehicle is best left on groomed trails, and it’s not likely to exceed 15 mph. Still, despite the vehicle’s limited practicality, the builder says the Cadillac Snowcat has been popular among Craigslisters. “I’m literally fielding about 30 calls a day,” he told me over the phone. So it’s probably only a matter of time before someone picks this thing up. I don’t know what they’re going to use this thing for, but whatever they do with it, I hope they film it, and send the shenanigans to tips@jalopnik.com.